As a presidential candidate in 2008, Barack Obama made his opposition to the war in Iraq a centerpiece of his identity. NPR Correspondent Don Gonyea notes that Obama repeats his position as “the only candidate who opposed the war in Iraq from the beginning” at nearly every campaign stop. No doubt this position helped Obama win first the Democratic primary, and then the presidential election later that year. Assuming the role of president, however, Obama had to counter a very different image: the Democratic leader stereotypically “weak” on defense. Throughout his campaign, journalists commented on Obama’s ease in shifting his image, particularly regarding his own racial and geographic identity—a black American, the son of an immigrant, the grandson of a white Midwestern farming family, a native of Hawaii—what Communications scholar Gwen Brown called “a collage of many different stories.”1 Obama’s inauguration showcased again a modulation of his identity, this time balancing his anti-war past with his present role as powerful commander-in-chief. 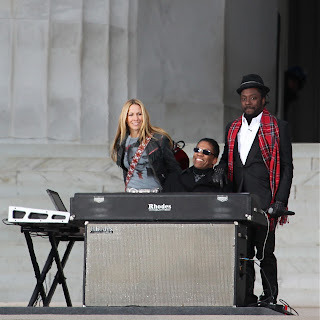 His effort to do so can be seen in the carefully curated musical selections for his pre-Inaugural celebratory concert “We Are One,” held at the Lincoln Memorial the day before the Inauguration. Obama’s strength as leader was underscored at the outset. The United States Army Band opened the concert with Aaron Copland’s Fanfare for the Common Man, played just before Obama entered. The heralding brass and drums, performed here by men and women in uniform, signal Obama as commander-in-chief. The selection of Copland added a touch of populist Americana, and also subtly alluded to Obama’s Midwestern roots through Copland’s popular connotations of the prairie.2 Immediately following the Obamas’ and Bidens’ entrance, the band struck up The Star Spangled Banner, sung by Master Sergeant Caleb Green. Unlike many recent pop performances that adopt a duple meter, a more traditional triple meter was used here. Mark Clague has remarked upon the expressive power of duple meter in iconic performances by Beyoncé and Whitney Houston, likening their renditions to a prayer; the rendition here, with its quicker triple meter and more emphasis on each beat, created a march-like effect and furthered Obama’s image of strength. The concert that followed featured an alternation of musical performances and readings, often quotations from prominent historical figures like Thomas Jefferson, Dwight D. Eisenhower, Thurgood Marshall, Marian Anderson, and Barbara Jordan. One of the few readings not quoting past leaders was Tiger Woods’s dedicatory speech honoring the Armed Forces. Woods reflected on his own father, a member of the military, and concluded by saying “We must always stand by and support the men and women in uniform and their families.” The exhortation to support the troops was doubtless familiar to many as a Republican slogan during George W. Bush’s years. Indeed, Woods’s speech appeared so strongly to recall Republican wartime values under Bush that it inspired a chain email that erroneously suggested Woods had surprised Obama and angered liberals by paying tribute to the soldiers. The desire to praise the service and sacrifice of the military appears to be part of Obama’s plan. Yet the musical performances surrounding this dedication paint a more reflective stance that suggests Obama’s anti-war candidacy. And we got that racial hate. Even will.i.am’s own performance is softened here, abandoning his original incisive rapping—a hallmark of hip hop’s political past—for a more harmonious, mainstream-friendly, almost sing-song approach to the verse. Indeed, while hip hop artists appeared covering other songs at the concert, this moment is as close as hip hop came to being included in the celebration. If “One Love/Where Is The Love?” offered a throwback to Obama’s anti-war past, and Woods’s dedication presented an unabashed patriotic positioning of Obama as commander-in-chief and supporter-of-troops, the song that followed Woods offers further ambiguity. Woods concluded by proudly announcing the U.S. Naval Glee Club as the next performers (but not the soloist, opera star Renée Fleming), who perform Richard Rodgers and Oscar Hammerstein’s classic “You’ll Never Walk Alone” from Carousel. After Fleming sings the song, the mood shifts slightly. The US Naval Chorus reprises the song, accompanied by a steady march-like drumbeat that emphasizes the lyrical message of persistence. Accompanying their performance, a montage of photographs of soldiers leaving their families are displayed. The message seems clear: by supporting the troops, we assure them that despite the difficulty of their service, they never walk alone. But Fleming retakes the lead halfway through the song while a second montage plays, one of photographs of soldiers coming home, beginning with a sign that reads “Welcome Home Daddy” with a picture of a soldier holding an infant, then panning up to reveal a toddler holding the sign, revealing the years passed during the war. For a president who campaigned on ending the war, these images suggest an anti-war reading of supporting the troops by bringing them home. Indeed, this message is more in line with how the original song may have been read. As musicologist Jim Lovensheimer observes, Carousel debuted in 1945, and the song was originally sung to provide comfort and support to Julie Jordan after her husband, Billy Bigelow, had been killed.4 Such a scene would have resonated with young women widowed during the war, and for those who know the original, could similarly invite here a critique of the Iraq war’s tragic costs. These performances were only a few of the many that celebrated Obama’s inauguration that day (a full two-hour video is available here), all of which served to underscore his identities and ideals in various ways. As Donald Trump’s inauguration is taking shape, the ongoing coverage of who will—and won’t—perform at the event offers a rich perspective on how Trump is seeking to shape his political and personal identity, as well as how performers are choosing to define their own identities alongside his. As Obama’s inauguration reveals, paying attention not simply to who performs, but also what they perform, how they perform, and where in the order they perform can matter a great deal as well. So listen up on January 19 and 20, as Donald Trump scores his Presidential victory. Dan Blim is an assistant professor of music at Denison University. 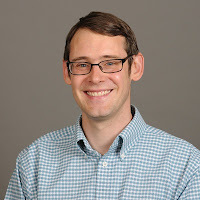 His dissertation "Patchwork Nation: Collage, Music, and American Identity" was awarded the Society for American Music's Wiley Housewright Dissertation Award, and his ongoing research and teaching interests include film music, Broadway musicals, and music and memorialization.